​1879 - Ritter Hendricksen is born in Germany. ​1910 - 21-year-old Hendricksen joins the Die Fliegertruppen des deutschen Kaiserreiches, becoming one of Germany's first pilots. ​1914 - 25-year-old Hendricksen flies in Paris during WWI. ​1916 - 27-year-old Hendricksen begins piloting both Riesenflugzeug & Grosskampffluegzeug for the Luftstreitkraft. ​1920 - 31-year-old Hendricksen becomes an outspoken naysayer of the Nazi Party. ​1933 - 44-year-old Hendricksen leaves Germany when Hitler comes into power. ​1939 - 50-year-old Hendricksen tries to join the British air service when Germany invades Poland but instead joins the Blackhawks. ​1944 - 55-year-old Hendricksen & the Blackhawks save New York from a German nuclear bomb. 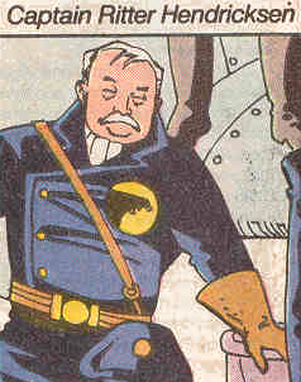 ​1947 - 58-year-old Hendricksen & the Blackhawks help kill Hitler's brain. ​1951 - 62-year-old Hendricksen retires when Janos Prohaska is lost. ​1953 - 64-year-old Hendricksen becomes a speaker in the German Parliament. 1958 - 69-year-old Hendricksen dies of pneumonia. 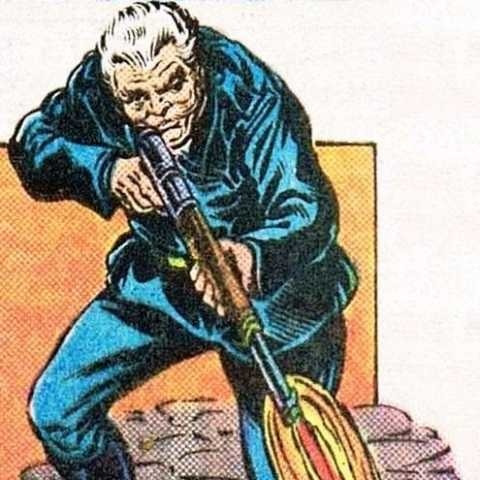 There are versions of the Blackhawks where Hendrickson, the oldest member of the squadron and resident explosives expert, is actually "Hans" instead of "Ritter", and is a native of Holland. It's understandable that having a member of the Blackhawks be German created a few narrative hang-ups, but we absolutely love the idea of a Soldier of Fortune actually fighting against his own countrymen because it was the right thing to do. He actually flew FOR the Germans during WWI. This idea gives us a lot of chances to explore the role of avionics during Germany war effort, and makes him an absolutely fascinating character. The idea that he actually becomes a speaker in the German Parliament is entirely our own creation, but we love what is says about the evolution of the people involved in the war.